The relationship between the self and self worth is best defined as being correlated with the self’s understanding of its subjection to the will of others to the extent that we are subjugated by how others perceive us. This disgusting fact undermines our true integrity, granted we strive more to please others than to please our very selves. This by no means should be confused with the act of giving or the idea of selflessness, for it is one thing to please others through caring for the common humanity we share with them, and it is another thing to please others through superficial means in an attempt to feel accepted and worthy. The true value of self worth, though not fully attainable in the contemporary state where individuality is irrelevant (see earlier blog posts) is inherent in our ability to distinguish vanity from veracity when we attempt to determine what action is appealing and what action is factually just to our character. I kid you not. 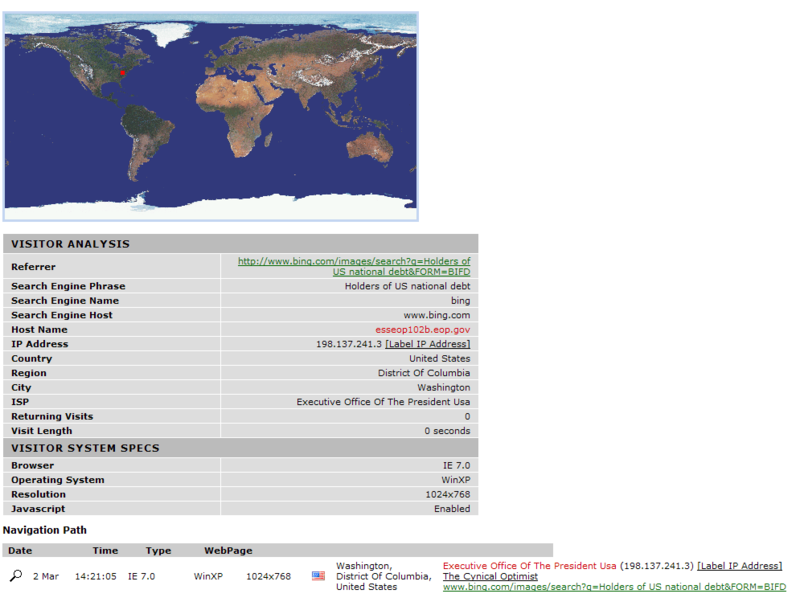 At least I can tell you that that I received a hit to my blog from the “Executive Office Of The President USA” (EXOP). I’m pretty sure it’s a legitimate hit because the President (or his peons) were searching on Bing for foreign holders of US national debt through this URL: www.bing.com/images/search?q=Holders of US national debt&FORM=BIFD –> And of course, as of today, the third image that loads on that page is from my most popular blog entry (which actually has been getting hits from search engines quite frequently). Oh, and for those of you wondering how I tracked the hit–I use a hidden counter that displays the Internet Service Provider (ISP) and approximate locations of computers that access my blog. In this case, the ISP was listed as the “Executive Office Of The President USA” (EXOP) and the location was tracked as Washington, District of Columbia. Click the image to the left to see what it looks like. The be sure, I also traced the IP address of the hit and I can definitely confirm that it was a government hit from the Obama administration. Of course, the address on that page displays the location of the network, hence the address is a random place in DC. This is typical for any ISP–if I track my own IP address, it won’t spit my exact address. However, given the fact that the Organization Name is EXOP, and that the search term is relevant to something the president’s administration has been concerned about moreso than ever, I would conclude that someone from his cabinet, if not himself or his close peons, has indeed accessed my Blog.